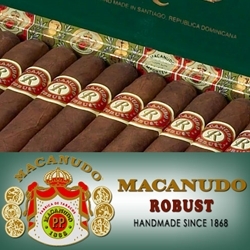 The Macanudo Robust is a hand-rolled premium cigar originating from the Dominican Republic. A very well constructed cigar handmade by highly skilled torcedos (cigar rollers) who combine a 3-country blend filler of Dominican, Honduran, and Nicaraguan tobaccos. A beautiful Connecticut broadleaf binder is used to hold this premium cigar gem together while it’s bundled up in a veiny dark Connecticut shade wrapper leaf. This complex combination offers sweetness with strength, offering its user a medium-bodied, rich-flavored smoke. Smokers Discounts are positive you’ll love the robust flavors of the Macanudo Robust cigars. We’ve made it easy and affordable to buy premium cigars online. A variety of sizes and flavors are listed below for a discount price! Call us for more details!